Does Lotto Master Formula Really Work? Read Reviews! 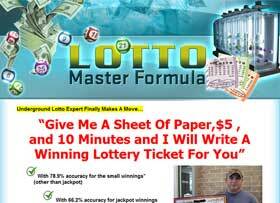 Lotto Master Formula doesn’t say anything about how exactly it is supposed to work. It only brings forward some ‘interesting and creative’ numbers such as a 66.2% accuracy for predicting jackpots. Lotto Master Formula Exposed — How Does It Work? Are you ready to start using a lottery software that will turn everything you touch into solid gold? Do you want to go from a regular Joe and become a millionaire overnight? If you do, then according to Lotto Master Formula it appears you will be in luck. Lotto Master Formula promises to deliver by introducing you to a revolutionary app. Sorry – it’s not going to happen at least not with this software. We’ve got this guy who calls himself Greg G. who claims that after spending many years conducting research, he came up with a winning system. In his spiel, he says that he is good with numbers, has an excellent memory and uses ‘his mother’s words’ as his mantra. Allegedly she said when he was a boy, she foresaw an amazing future for her son and expected him to work for NASA one day. I can only imagine the poor woman’s disappointment now when her son is not even close to meeting her expectations and instead sells a bogus lottery software system. I have to say that I’m laughing out loud while explaining how Lotto Master Formula is supposed to work. In their own words, our boy Greg G. says that all it takes is to give him five dollars, a sheet of paper and 10 minutes for him to write the winning lottery ticket for you. I can only assume that he lacks the five dollars to do this himself. Pretty much anyone could find a sheet of paper and 10 minutes, so why wouldn’t he just write his own winning lottery ticket numbers. Jokes aside, the software doesn’t say anything about how exactly it is supposed to work. It only brings forward some ‘interesting and creative’ numbers such as a 66.2% accuracy for predicting jackpots. Generally, there is a scarcity of Lotto Master Formula complaints. I guess someone has actually to buy it to complain about it. In addition to creating a horrendous website that looks like a cheap sales copy for Forex robots, these guys have spawned a few sites that try to prove that their product is not a scam. Of course, their efforts are superficial, and the copycats are reproducing the same content as the one existing on the original website, which pretty much defeats the purpose. One critic (guess he tried it out) dismisses Lotto Master Formula as junk and claims it was plagiarized from different websites, something that I have to agree with. Is Lotto Master Formula Worth your Money? Have you read anything I’ve written so far? If you did, then you know for a fact that I wouldn’t spend Monopoly money on Lotto Master Formula must less real cash. Greg G. or whatever alias he might be using is an example of how people hope to capitalize on other people’s lack of information and naivety – and greed. I don’t think that I exaggerate when I say that we would’ve all been better off if his mother had been right and Greg G. was in a spaceship right now instead of marketing a worthless software. You might be surprised to hear me say this, but despite the out-of-this-world offer that Greg G. made to me, I still passed on Lotto Master Formula. Just today the price dropped from $150 to just $97, but they remind us that the offer is not going to last long as only 500 copies are available and they are selling like hot cakes. Would you mind rating Lotto Master Formula? Lotto Master Formula is a messy site that instead of being informative, bludgeons people with poor graphics, too many fonts, and too much spiel. There is no information on what it does and in our unbiased opinion is a fully fledged scam that can only sucker in extremely naive players. I couldn’t resist going in and seeing if this site looked as bad as the review said. It’s worse right from the start. I say that as it starts off with that guy blathering on about how he can take your $5 and turn it into a winning ticket. If he could actually do that, wouldn’t he do it for himself.